Remember the Seinfeld episode when Elaine had the audacity to peek at her medical chart? There was comedy in the fact that she would dare to ascertain the contents of her medical history. That may sound a bit ludicrous today, but it's sobering to think that too many patients still don't consider themselves to be owners of their health data and too many are not afforded proper access to their medical records. Christine Bechtel and Erin Mackay want to make certain those conditions are a thing of the past. As coordinators of the GetMyHealthData initiative, they've taken a leading role in getting the word out that more must be done to ensure patients can readily access and use their electronic health information. For The Record (FTR): What was the genesis of the GetMyHealthData campaign? Bechtel: GetMyHealthData was born in response to a provision of the federal EHR incentive program known as meaningful use that required providers to make electronic discharge summaries available to patients upon request. A year ago, several hospitals attested, under a penalty of perjury, that not a single patient had requested his or her data under the program. Yet patients were telling us in national surveys that they really wanted their health data. In fact, 55% said they logged on three times a year or more to use that data. So with all the policies and technology in place, and consumers saying they use their health data when they can access it, we found it hard to believe that not a single patient asked. Our theory was that by getting more consumers to ask for and compile their electronic records, data would be liberated and begin to move around the health care system in a way that helps patients and helps health care providers succeed under meaningful use. In other words, this would be a win-win. FTR: Please explain the initiative's goals and what you found during the first year. Mackay: Our 12-month sprint was designed to empower patients to ask for their digital records, give them the resources they needed to successfully navigate those requests, and study what happened. We envisioned consumer demand helping to drive changes in practice and culture so that easy access to data would become the norm. In a nutshell, we found that consumers were asking for their data but the system was breaking down in some key ways. For example, many patient requests were routed through medical records departments so rather than being able to download their data from a portal, patients ended up with reams of paper or huge PDF files that were hard to read and impossible to upload into an app. FTR: What's the evidence that patients want to access their health data? Bechtel: National survey data clearly show that patients and family caregivers want access to their health data. A 2014 survey by the National Partnership for Women & Families showed that 86% of people who have online access to their data use it at least once a year; 64% of people whose doctors have paper records say that online access to their health data is important. FTR: Is the quest for more access being fought more on the local level than the national level? Mackay: Changes to improve patient data access need to happen at both the local and national levels. The policies that enable access were largely created at the national level, such as the meaningful use provisions requiring providers to offer patients the ability to view, download, or transmit their health information. Meaningful use also created technology with standardized features to make online access possible. What's more, improvements to HIPAA gave patients the right to electronic copies of their records in the form and format they want, given to them how they want, as long as the provider has the technology to do it—which most do thanks to meaningful use. But what we learned from volunteers who requested their data is that there is a big gap between national policy and practice on the local level. We think the next set of hurdles to clear is at the practice level: We need breakthroughs in information-sharing practices with consumers to make access to data easy, automated, and routine. FTR: Is there a unified strategy to raising awareness? Bechtel: There is not a unified strategy to raising awareness and that's a big part of the problem. Consumers are interested, as demonstrated by a series of major media stories on the issue in the past 12 months alone, but there is no unified strategy to reach providers. The good news is that Health & Human Services recently released a series of videos to help consumers and providers better understand individuals' rights to get electronic copies of their health information. The bad news is that these videos are not part of a unified strategy supported by the funding needed to really raise awareness across the country. That being said, we think there is another strategy with great promise: Have doctors proactively offer data to patients rather than waiting for patients to ask for it. To that end, GetMyHealthData has called on health care organizations to step forward and implement strategies for getting data into the hands of patients, and share lessons learned and best practices so we can create a more unified strategy. FTR: What hurdles need to be cleared so that patients can easily view their data? Mackay: There are three main hurdles that need to be cleared so patients can easily get their data. One is cultural. Data are not often viewed as a tool for consumer empowerment. Too often, providers question why consumers want their data and treat their requests with skepticism rather than as an opportunity to partner with patients. That has to end. The second hurdle is fees. Patients are being charged a variety of fees for their own records, including per-page fees for electronic documents that don't have pages and even fees for patient portal access. These fees pose an obstacle to consumer access as well as patient engagement in their own care. Third, there is simply not enough awareness about this issue. Provider organizations often don't know the details of patients' access rights or don't have a process set up for giving patients their digital health information. And of course we have to increase patient awareness that they can get their health data electronically—specifically, that it is their right to get information in whatever format best meets their needs. FTR: Why are data-holders reluctant to make patient information more easily accessible? Bechtel: Mainly this is an issue with the culture of health care. Our health care system treats data as a tool for doctors, but when consumers ask for their records, it can raise fears that individuals want to use the data for a lawsuit or take it with them to a different provider. We need to address those concerns and transition away from a culture where a patient data request is viewed as a legal matter or business risk. FTR: What can we learn from cases like that of Foghat bassist Craig MacGregor, who was unaware a small cancer nodule had been detected during a CT scan to check for broken ribs but not disclosed to him? Four years later, the nodule was 60 times larger and inoperable. Mackay: One of the important lessons from this tragic story is that patients should get a copy of their medical records at every encounter, just like they get a receipt for their cup of coffee at Starbucks. Consumers should have the option to get those records electronically so they can use technology to make sense of the data. There are many examples of people who, just by looking at their records and using technology, were able to learn things about themselves that their care team didn't share with them. There are other examples of patients being empowered to ask questions about what they saw in their data and the resulting dialogue led to a different diagnosis or treatment path. The great news is that a regulation was finalized in early 2014 that now allows patients direct access to their lab results. That's a big difference from when Mr. MacGregor went through his original testing in 2012. FTR: Are patients qualified to "read" medical records? Bechtel: Yes. Patients often catch mistakes in their records and they have the right to request that those mistakes get corrected under the law. Increasingly today, technology helps patients turn raw data into actionable information—that's the great benefit of consumer health apps. But even without an app, evidence shows that patients benefit from seeing data like their doctors' notes. For example, the OpenNotes project has demonstrated that when patients are able to read their doctors' progress notes—even when those notes are in very technical jargon—they don't flood the doctors with questions. Instead, patients are resourceful and figure out how to interpret health information in the way that they need. What's more, the project showed having access to those notes increased the frequency with which patients took their medications as prescribed, which improves health outcomes. The bottom line is that patients seek out resources that help them read and act on the information they find in their records. FTR: What would you change about HIPAA? Mackay: Right now changes in the law are not a major issue. The challenge is in applying the law in practice. If we had a magic wand and could change the law, we would: Eliminate the ability of providers to charge fees for individual patient access requests because fees stand in the way of patient access, and if the records are held electronically, require that the turnaround time to meet the patient's request be 10 business days or fewer (currently it is 30 days). But again, the most important next step is fully applying the benefits of the current law in practice. 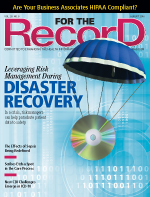 FTR: It can be intimidating for patients to request access to their data. Do you have advice for patients reluctant to approach their providers about sharing data? Bechtel: Yes! We created a short video that walks patients through the three steps it takes to get their health records. The website also has a troubleshooting page. Both are available at GetMyHealthData.org. FTR: What recourse do patients have when they've been denied access? Mackay: If patients have been denied access, the first thing they should do is talk with someone else at the provider's organization. Willful neglect of the law doesn't often happen, so it may be a matter of finding a better-informed or more helpful person. And patients can use the resources we've compiled to help in these circumstances at getmyhealthdata.org/home/troubleshooting/. If that doesn't work, individuals can file a complaint with the Office for Civil Rights at hhs.gov/hipaa/filing-a-complaint/what-to-expect/index.html. This is the federal agency that enforces HIPAA. FTR: How much should patients foot the bill for access? Bechtel: In our view, patients should not foot the bill for access to their own health records. However, the law does permit some fees. How much patients can be charged often is influenced by state law, but it is always governed by federal policy first—unless the state law is actually better for patients. When it comes to electronic copies, the only charges permissible under the law are the labor required to compile the records and the cost of the storage device (such as a DVD or a CD) used, plus postage, if relevant. However, there is nothing in the law that says providers have to charge fees, and an increasing number of them are not. They recognize access to health information is essential to patient care and a cost of doing business. Many records are available for free on the patient portal, and every patient portal either has or will soon have an option that allows patients to download their health records for free. — Lee DeOrio is the editor of For The Record.